I heard so many times “I am not flexible” or “You know, I am not exactly the kind of big muscles guy”… And so what, it’s not a problem! Capoeira is a Brazilian martial art: it is about dancing, is about music and finally it is about communicating. There is no need to be sporty, flexible or whatever. Anyone can try, the only thing you need to do Capoeira is the urge and the desire to play! Let’s have a short comparison: When you start to learn piano no one is going to ask you to play the 9th of Beethoven. In Capoeira this is the same, we won’t ask you to do these crazy moves you can find on youtube. We start with basics like Ginga and by and by you will learn new moves. There is no competition between players, everyone learn at his own rhythm. Some are good at moves, some are good with music, some are good everywhere and some are bad. But no one will blame you for that. The only fact that you want to improve means something. And if you keep practicing, sooner or later, you will be good. Training is the only salvation for everybody. 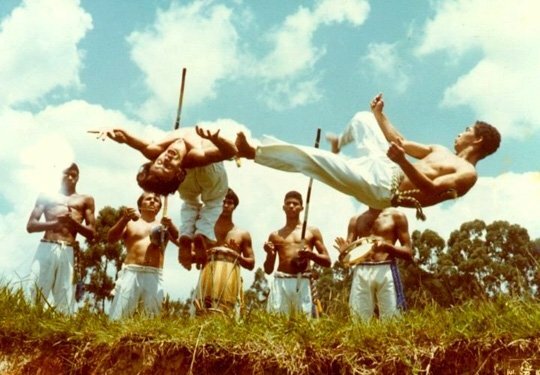 When you look at the Roda, you can see 2 Capoeiristas playing. If you pay attention at their faces, at their attitudes you can clearly understand that these 2 people are enjoying. Even if there is no reward at the end, there is no competition spirit like you can find in other sports. But I tell you, these guys are not mad, they are just happy to share a good moment with a friend. When I started Capoeira few months ago, I was afraid to go in the Roda, I was enjoying Capoeira just by watching others playing. I was not sure from where this happiness, this good mood, was coming from. Then I entered the Roda, and started to understand a little bit. I am still a beginner but now I can put words on it. I think we can compare the Roda with a mirror. The Energy is coming out of the 2 Capoeiristas, they are pulling out this energy from their mind, from their moves, from the music and from the songs spreading this energy everywhere around them… With the clapping, with the voices, with the music, the Roda reflects all the energy to the Capoeiristas and when they are good, when the Roda is good, you can feel it floating in the air. If you look at the people playing Capoeira in our gym there is women, men, young and older, sporty and not, flexible and stiff. At the end all these people come for the same reason: sharing a good time. I’ve practice a lot of different sports and I think this is the first time I find something where I can blossom so much. 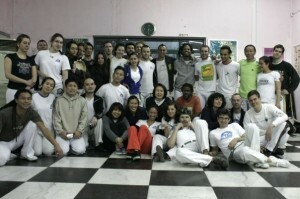 The spirit of Capoeira is magic. That’s why I am always asking people to come in the gym and have a try. I hope that every people I know can come training with us one day or an other.